There are all sorts of diets or “lifestyle choices” as some like to call it. You can do Whole30, Paleo, Keto, Vegetarian, Vegan, Plant Based, Low fat/high carb, Intermittent fasting, you name it. I have tried a number of these and I will say, most of these can be lifestyles versus “diets”. In fact, intermittent fasting is often paired with any lifestyle. For instance, vegans, paleo, keto, and plant based eaters can easily adapt intermittent fasting to their daily regimen. Intermittent fasting is my most favorite way of lifestyle, along with eating plant based. You choose the time of your last meal and the time of your first meal and try to plan at least 16-18 hours of non-eating. But What’s the Problem with ALL these Lifestyles? It’s easy to lose focus on balance. I speak for myself but I tend to get caught up in one certain way and lose track of balance. It’s great to live a healthy lifestyle and I’m all for this. However it’s also vital to listen to your body and your body’s wants/needs. Oftentimes this is in the form of supplementing or implementing a healthy balance of certain foods supportive to your body. 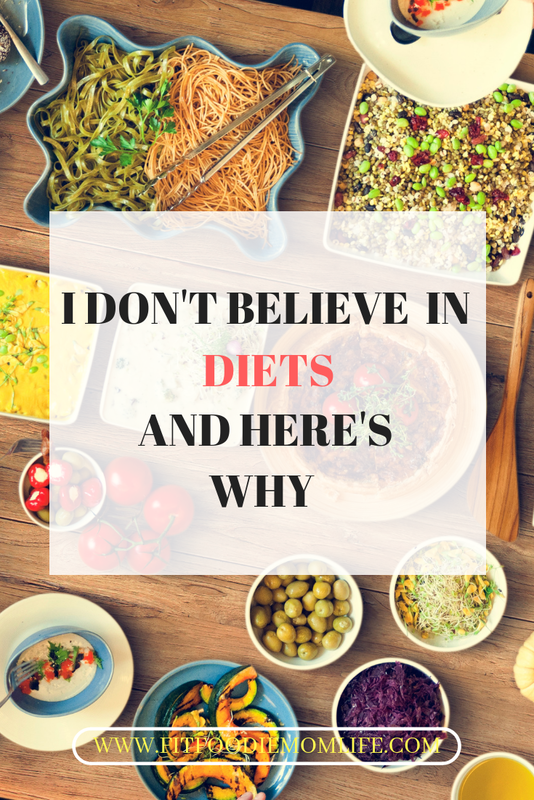 I don’t believe in diets. Sure, that sounds like a straightforward statement, but let me explain why. A diet tends to eliminate certain foods or limit the intake of fats, calories, fruits, vegetables, and grains for an adequate amount of time. If however you are follow a “diet’ for health concerns or to maintain a healthy weight, it’s best to consider choosing a lifelong lifestyle adapted to your specific needs. Diets tend to restrict you of what you cannot have. Of course eliminating sugar, high sodium, processed foods, unhealthy fats and carbs, and energy/sugary drinks is a good elimination and something your body will thank you for in the long run. Getting rid of those food/drink items should not be considered a “diet”. Essentially a diet eliminates a certain food category for only a specific amount of time (anywhere from 30-90 days). But once the diet is over, most of those foods are reintroduced. And this is where I have a problem with diets. Your health shouldn’t be viewed as a “quick fix”. Jumping on a diet for x amount of days will not cure all of your health problems. It’s a lifestyle and needs attention daily. Whether you support your system with whole foods, organic based personal care products, supplements and adequate amount of sleep, it’s important to be aware of your body’s needs and how to properly take care of you. Knowing your body and listening to it is key to maintaining a healthy lifestyle. Try to avoid jumping on another “diet train” for a specific amount of time. Every health habit changed for the better is a goal met. The reason why diets fail is because once you get “off” the weight comes back on. Or the health issues start all up, and sometimes the unrealistic goals are impossible. Most diets follow “less calories, more exercise” and this is very challenging and frustrating to keep up. It’s better to follow a lifestyle and adapt it to your personal needs and change it up as you need to. Perhaps begin with dropping sugar and then eventually processed dairy and/or refined flours and processed foods. Is there a certain lifestyle you follow?